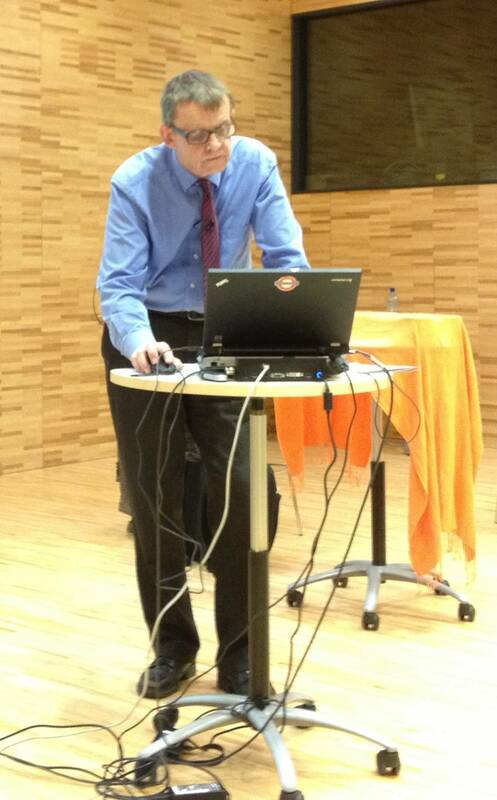 In my last post, I wrote about Hans Rosling’s visit to the World Health Organization and my conversation with him. In this post, I share some reflections on presentations from Rosling’s 90-minute talk on global health trends. Rosling was in the room preparing for the presentation more than one hour before it was scheduled to begin. Putting on the final touches. For those members of the WHO and UNAIDS who were not able to see Rosling’s talk in person, the event was streamed live over the Organization’s Intranet. Although I planned to attend in person, a little more than an hour before the start time, I decided on a whim to log on to the simulcast. And who was there, but Rosling himself, already fitted with his microphone, making some final preparations and chatting with the technicians. Lesson: Always arrive early. Having the extra time will allow you to (a) make sure that the equipment (computer, beamer, microphone, etc.) is working properly; (b) set up the stage area properly; (c) get a feel for the room; (d) meet your hosts and the technicians; and (e) meet some of the audience members beforehand. Rosling was very comfortable with the technology. When I arrived, Rosling was working away on his slides, checking some, cutting others and reordering still others. And all in plain sight of anyone in the room as his pre-presentation fiddling was displayed prominently on the screen behind him. What surprised me the most was that, with less than 25 minutes before the start time, Rosling decided to make a new slide from scratch. It was a relatively simple graph, but still, it had axes, labels, different sized lines and even animations. I don’t advocate making so many changes just before your presentation (and certainly not on the big screen in the room where you are presenting). I want my slides to be finalized well before I am ready to start. But there was not a hint of panic about Rosling. He worked quickly and methodically, completely at ease with the software. Lesson: If you are going to use slide presentation software, know how it works. You are the one who is ultimately responsible for being able to use it properly. If you are not proficient at using PowerPoint or Keynote, there are many books and online resources to help you. But one of the best ways is to to learn by doing. Take a presentation that is already done, make a copy, and then experiment with the copy. Try things out, make a mess and then start again. In short, practice. During his introduction, Rosling interrupted the person introducing him. Rosling’s presentations are never dull, and this one had already perked up before he had even begun to talk. The person introducing Rosling began to venture into the subject matter on which Rosling was going to speak. At that point, Rosling rushed over to him and playfully told him not to give things away. It was done in a light-hearted manner and generated a laugh from the audience. Still, it would have been better had it not happened. Lesson: Know what your introducer is going to say about you. Better yet, work with the person introducing you to create a simple script that says a bit about you, generally what you are going to talk about, and why it is important for the audience. At the beginning of his talk, Rosling invited audience members who were standing in the wings to come to the front and sit on the floor. 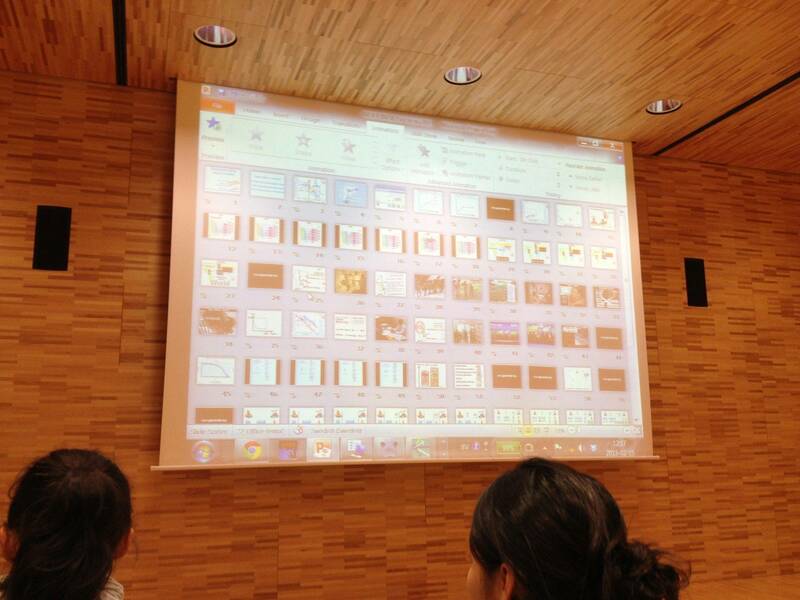 Rosling’s presentation was held in the Kofi Annan room at the UNAIDS building. It is a large room but for Rosling’s presentation, it was simply not large enough. All of the seats were taken and many people were obliged to stand in tightly packed groups along the sides or way at the back. Of course, this was not Rosling’s fault—one has to work with the room one is given—and he could have easily given his presentation without worrying about those who had to stand. But he didn’t. He saw the uncomfortable situation for some of the audience members and did what he could to alleviate their discomfort. As a result, approximately 25 to 30 people got a front row (floor) seat. Lesson: It is always about the audience. If you notice that your audience is not completely comfortable (because of the lighting or the temperature or the seating arrangements or whatever) and if you can do something to help that will not unduly disrupt the presentation, you should do so. This entry was posted in Hans Rosling and tagged audience, Hans Rosling, Microsoft PowerPoint, World Health Organization. Bookmark the permalink. Hola! I’ve been reading your web site for a long time now and finally got the courage to go ahead and give you a shout out from Houston Texas! Just wanted to tell you keep up the good job! Excellent lessons. When it comes to introductions, I usually have a pre-written, pre-typed introduction in 20 pt type that I give to the introducer. The introduction is tailored to the audience and the topic. Many times I don’t know who the introducer is until I arrive. Thank you, Harley. I’m with you on the introductions. Always best to do it yourself – that way you know what is coming. And, most introducers love the fact that there is one less thing for them to do before the event.